Today I make lasagna. I don't know, it just feels like new years somehow -- in a simple, easy, homelike, fireplace, warm, steamy, spice-smells sort of way. I've done some really complex new years dinners, and my friend meriko goes nuts with hers. But for some reason my default is something comfortable. I'm going to make the lasagna "properly" in the sense that it's going to be a long-cooked meat sauce from scratch with both beef and pork. A bechamel sauce as well, along with ricotta (which I love with a loving love) and mozerella. There's a bunch of "cooking prep" that goes into a lasagna, and none of it's very difficult. But a large number of little bits can really throw folks off. The "hack" part of this is something I'd heard about a while back and have since completely embraced. I put the pasta in raw. There are special "put in raw" brands of lasagna noodles, but some cooking magazine did a test and found it didn't really matter what kind you used. Years later I actually tried this approach and it works fantastic. You leave your tomato sauce a bit loose (or add a bit of water before using, maybe half a cup) so there is extra water to help cook the pasta, and you cover the lasagna for the first bit of cooking (which lots of recipes have you do anyway), but really that's it. The only real downside to this is you have to snap the pasta rather than cut it if you are trying to get it to fit into an odd-shaped container. I've done this with other baked pasta dishes, such as baked ziti, which is really just tube pasta baked in tomato sauce with cheese and whatever else you find interesting. I think the last time I found mushrooms interesting. I haven't yet tried this with macaroni and cheese -- but I theorize that if I made the cheese sauce looser it likewise would be able to cook the macaroni while baking. But I hesitate to tamper with my mac and cheese. Carol's kids have turned into big fans of it, and like to help make it. And even several "guest kids" have voiced their approval -- after some initial hesitation because it wasn't "the normal kind." Mr. Kraft you have a lot to answer to. Michael and Sydney (the aforementioned offspring) are great eaters. They've got their normal food dislikes (hey, we all do, even me), but for the most part they'll at least try anything. They love broccoli, duck, shrimp, real BBQ, rice, beans, salad. Sydney's first "real French meal" was a cassoulet I made, complete with a massive range of meats. Michael is currently angling for me to make him a "fancy dinner," which I'll probably do before too long (I'm thinking quail). Carol claimed they are now actually "spoiled" with respect to food but I just like to think of it as enlightened. Of course, I'm not the one who has to put up with "But Mom, how come you don't make broccoli like Tom?" "Damn you, they used to be happy even when it was just steamed!" Oops. To wrap this back to the original topic, a few years back we spent new years with another family -- one whose kids are picky eaters (their Dad, a close friend of mine, has a standing $10 offer for the first person who can get his kid to eat chicken). We made homemade pasta (the kids all liked helping, and I don't know a kid who doesn't eat pasta). I put together a complex lamb and reduction sauce main course for the adults (using some of the pasta twirled up as a base -- I wish I'd taken pictures, it was freakin' great looking). But of course, Michael and Sydney wanted the lamb too, and the sauce, and the green beans, and even were eyeing the morel mushrooms (neither of them like mushrooms, but these looked more spooky, I think). There was quite a bit of "if she" (referring to one of the other kids) "doesn't want lamb, can I have hers?" Sigh. Now I almost wish I had some lamb. But, to the pans -- it's sauce time -- and the pasta hack. Update: Also made a fugasse which is a flatbread made basically with a soft pizza like dough. But you roll it out oblong and flat, and then slash it into a 'tree'-like shape (I use a pizza cutter to do this) and pull the tree out (I don't really know how better to describe this, and hopefully a picture will eventually appear). You end up with an octopuss/tree/fan/butterfly shaped flat bread. You cook it at high heat (I use 450 on a pizza stone) so that the outside is very very crisp. After pulling it from the oven, I drizzled some pepper infused olive oil and coarse salt over it. Tonight I made one of my favorite weeknight in the winter dinners. It's quick and easy and turns out (usually) great. The "quick" part only refers to the amount of time you spend in the kitchen -- you have to start three or four hours before you eat. I brined a chicken in about a gallon of water and a cup of kosher salt. I added some thyme and sage and other chicken-appropriate flavorings to the water. After two hours in the brine, I dried off the chicken and let the skin air dry out for another 45 minutes. Then, I coated the chicken in a layer of rendered duck fat -- actually the fat I used came off of foie gras. The chicken went onto a V-rack in a roasting pan. While the oven was coming up to 375, I medium cubed 4 or 5 small baking potatoes and placed them in the bottom of the pan, underneath and around the chicken. Baked for around an hour and 15 minutes. Towards the end, I hit the convection switch on the oven to ensure even browning (could probably have done this sooner, and wish I had -- for this chicken, which was on the small side, I also should have roasted at a slightly higher temperature for slightly less time.). Pulled the chicken off to rest (and drained out any juices back into the pan). I removed the V-rack from the pan and returned the roasting pan back to the oven, cranking the heat up to 450. Every few minutes I shook the pan to make sure the potatoes were browning evenly. After 5 or 10 minutes, they were done, and I pulled the pan out. I scooted the potatoes to one side of the pan, tilted the pan, and left a heavy weight on the other side to keep them draining. Let them drain while I carved the chicken. Salted the potatoes. Plated with the chicken. Ate. There are a million variations on this one. The seasoning is one. I've done BBQish, Mexican influenced, heavy on the rosemary versions. I've put spices into the potatoes. Sometimes I make a sauce -- light brown stock, or heavy dark stock with red wine, or white wine and mustard. I've used all kinds of potatoes on the bottom. Added mushrooms to them. I don't alway have duck fat, so I've used olive oil, butter, rendered chicken fat, bacon drippings. When I'm in a hurry I only brine for 30 minutes. Sometimes I don't brine at all and just heavily salt the chicken. The only real trick to this recipe is not stirring the potatoes while they are cooking. Halfway through the cooking they will be soft, but the outsides not yet crispy enough to keep them together. If you try to stir them at this point, they'll just mush-up. Did you get a DVD player for Christmas? Do you need something to fill it? Here's my list of movies about or containing food. This is probably my alltime favorite movie. I think that the respect and attitude towards food is fantastic -- but the plot also moves me. Subtitles. Some opera. This may throw off some folks, along with the "yearning" aspects of the story. But, for me, there is no other food movie. The earlier scenes in this movie are funny, and the "big night" itself is a fantastic whirl of food and cooking and eating. I found the end to be a bit of a cop out/let down -- but the final scene of a real time making of an omelette in one take is pretty neat. Both a slice of family life, and a view of how Chinese food and culture and intertwined. Lots of interesting cooking scenes. Subtitles. "The last of the great noodle westerns." High Noon meets Iron Chef. While noodles are the focus, it's really about the Japanese obsession with food in general. Subtitles. A recent film, which I just saw. The "food" is really Chocolate and pastries. Some found the going slow and the subtext of "religion as evil" too much too take. I wouldn't put it high up on my list of favorites -- but it was a fine way to spend two hours. The cooking scenes and info are accurate, although sparse. This is one of my least liked food movies. The discussion of food and the cooking scenes are great -- but I find both the story and style so incredibly overwrought as to be a distraction. I know that stylistically this is how the story should be told -- but for me I find it turning what should be serious scenes into near comedy. Subtitles. Hard/Impossible to find. I only saw it via Lifetime or Bravo or some such cable channel -- maybe made for TV? Jason Lee plays an American who moves to France to learn to cook and finds himself in the middle of the traditional apprentice system. Story is pretty trite, but there is some great food scenes, and the behind the scenes stuff is accurate, although it may not seem so. English and French with subtitles as I recall. Here are some films with lesser amounts of food in them that can still be somewhat interesting. An interesting little film about two men who decide to open a tavern. Almost by accident they find success in the form of good food. A kid on the skids turns out to have a knack in the kitchen, which I also found very enjoyable. Who is Killing the Great Chef's of Europe? VHS only. It came from the 70s -- but some neat scenes in the more traditional-industrial-hotel style of kitchens of this era. Comedy. Kind of strange to have this one on here. Julia Roberts main character is supposed to be a food critic (quickly tossed aside) -- and at the start of the film we see a real kitchen with a real Charlie Trotter playing himself, "If you don't get this right, I'll kill your entire family." Supposed to be set in NYC, with the remainder of the movie in Chicago, the restaurant looks to my eye to be Charlie Trotter's actual place in Chicago. Not a particularly great movie -- and why two stars would want to be in a comedy about stalkers boggles the mind. Still, there's a chef, some cooking scenes, and a reviewer used as comedic foil. "That's alot of bread, sir." My secret BBQ shame is that I often enjoy the sandwiches that result from BBQ more than the BBQ itself. This is partially a result of how I grew up knowing BBQ. My family used to take vacation to Texas almost every summer, two kids in the back of an Impala driving 3 days across half the country. Every year, shortly after crossing the Texas state line, my father would somehow direct the car off to a non-descript shack. I now know he probably used his nose to smell the wood smoke. It was always the same -- paper plates, white bread buns, and dark brown/red smoky shreds of beef. And, as always, it was the best meal one had ever eaten. So, to me, sandwiches are always what I think of first when I think of BBQ. The other reason why the next day BBQ tastes better to me is simple. After 12 hours of running a smoker, I can't even smell the smoke in the meat. It's in my shirt, my hair, and even my skin. I know the food must taste wonderful (as indeed the next day shows) but for the life of me I can barely taste the smoke over my own Eau de Bois. Today, I'm making hamburger buns in anticipation of tearing into my stash of brisket from Christmas Eve. It's one of those weird things about me. Most people would never think of making buns. Me, I'd never think of exiting the house on the day after Christmas and going to (of all places) a freakin' store! Yeast, water, butter, salt, flour (in that order). Kneading it in the KitchenAid, rising it slowly so that the crumb of the bread is small and dense (the butter helps here, too). Punching it down and turning it halfway through the almost two hour rise. Forming into little round balls and pressing them down flat into a half-sheet pan. Rising it again, and finally baking it at 350 until they're done. All very simple, but I do end up with close to two dozen buns. I mean, you don't even normally buy that many at once. My excuse is that they freeze. The reality is that I'll probably end up eating most of them in two days. You sweat the vegetables in a large dutch oven, then add in everything else but the beans, bring it to a boil, then add the beans. The dutch oven is placed in the smoker (or oven) at around 225, covered. It cooks until the beans are tender (which seemed to be around 4 hours), and later uncovered. This adds smoke flavor to the beans, along with cooking off any excess water. It also lets the flavorful grease from the meat drippings fall into the beans. I pulled them off the BBQ after a total of 10 hours, toweled off any extra grease on top, and let rest covered until we were ready to eat. You can actually cook them any amount of additional time as long as you stir them every hour or so, and add liquid if things seem to be drying out too much. The reason you can add salt at the begining, and why you can cook them so long is the acid in the tomato and the sulfer in the molasass. I also normally make them a bit hotter than this time around -- but I know Carol's mom doesn't like food that too spicy. The meat was interesting in that it got a very strange bi-level smoke ring on it. The "smoke ring" in BBQ is the red or pink color around the outside of the meat. It's formed when the nitrites/nitrates in the wood smoke combine with the myoglobin in the tissues of the meat. This same reaction is what causes sausages and hot dogs to be pink (although there, the chemical is placed in the meat rather than delivered via smoke). The process of smoke ring formation halts when the meat reaches around 140 (with BBQ meats generally being pulled from the fire between 180 and 195 degrees) So generally, I start my rig at a lower temperature and gradually raise it throughout the day. Smoke rings don't add anything to the flavor, but there is a certain pride in getting a really nice one. It lets folks you you really did "low and slow" it. I probably had a temperature bump at some point during the day which gave me this really interesting pink-red-pink-red progression into the meat. My other theory is that the meat was a bit colder this time around than normal, which caused it to warm up in an odd pattern. The "user group" for my particular BBQ rig (yes, there really is a user group!) would scoff at the above science. Lots of folks there say that thermometers (which I use) and science have no place in Real (tm) BBQ. Now I'm the first to love the art of BBQ -- and there certainly is one -- but why avoid the extra info on purpose? After all, these were the people that covered the outside of their firebox with styrofoam and then were surprised when it melted and caught fire! Yes, nothing says Christmas like 18 pounds of smoked meat. Carol's parents are coming over for Christmas eve dinner, and so I'm making BBQ. I'm running the BBQ at around 225-250 degrees today, so I should be able to leave the meat on until the guests arrive around 7 PM. I've also got a pot of beans in the smoker and I'm trying something new with them. This time, I soaked the beans but didn't cook them before putting them into the smoker (in a huge cast iron dutch oven I use for this and only this purpose). We'll see how they come out -- it would be cool if this One Less Step approach works out. I'm cooking them covered for at least the first 6 hours or so. Towards the end I'll uncover them to let them soak up the smoke and drippings from the meat. Later, I'm making Real (tm) Caesar Salad, and corn muffins with cillantro and cheese. Just so you all know it isn't 100% meat. Oh yeah, and the BBQ sauce is bubbling away on the stove as well. Today was a day of cooking hacks. Lots of "meals" made with leftovers, shortcuts, and various tricks. First off in the morning was biscuits and gravy. I had fresh sausage around, but for the gravy I used some leftover chicken gravy (which is basically all milk and cream anyway) and hit it with some extra Penzy's Black and Red to send it up into the spice area. Very quick overall, and you more or less didn't taste the sage from the chicken. Mostly. For lunch, I took some leftover tomato sauce from the week's chicken and made a pizza/focatia. The bread was a basic quick yeast dough with a fair amount of olive oil. A thin coat of the tomato sauce, some sliced smoked beef sausages, and a sprinkling of cheese. 45 minutes in a medium oven, slice, and eat while watching Clerks. Yeah, Kevin Smith kick. There was some hours of dough rising in there someplace. For a treat, I made Almond Brittle. Had a big sack of uncooked almonds. Mixed up a batch of sugar syrup and started cooking it off. I let it go a bit too close to hard crack (my brand new candy thermometer seems to have discharged the battery), tossed in the almonds along with some salt and baking soda (supposed to help it foam up so you can spread it) and cooked down until the sugar re-melted. Spread out on a greased sheet pan, let it set up and then cracked it into eatable bits. As I said, I went a bit too far with the inital cooking, but it was a nice dark brown and very tasty. Next time, I'll reign in that first wave. All in all, a very nice day of "casual kitchen." The week will become more involved. I'm BBQing on Christmas Eve, and Carol is making an elaborate Coke-brined pork leg for Christmas Dinner. Should be fun and interesting. After a very tiring morning of holiday shopping (you can't call it a day when you get it all done before 1 PM) we needed something comfortable. I sent Carol out for beer and bread and attacked the kitchen myself. A load of fresh onions was in the pantry, and there was still plenty of oxtail stock left (before long, expect an entry "Oxtail Stock" as I replenish the supply). Sweated down the thin-sliced onions for 45 minutes, and then added white wine, about a quart and a half of the stock, salt, pepper, and thyme. Let it all cook down for another hour. When it was properly thick and very dark, it still needed some sour, so I tossed in some brandy and a dash of red wine vinegar and let them cook out for another 15 minutes. Thin sliced the toast, broiled it in the oven with some butter and Parmigiano Reggiano on top, and served it up in huge bowls. I had two helpings. I was beat, but Carol stayed up watching Chasing Amy. I managed to catch the first part of it -- "What's a nubian?" Tonight I braised some short ribs in a combination of oxtail stock and red wine. After they were done, I took them out and let them rest a bit. The braising liquid was de-fatted and reduced until it was a glazee. Tossed the meat back in the reduction and finally served it all with pearl onions, butter braised mushrooms, fine dice of carrots and squash. I had everything to hand except the ribs themselves and the squash. So it was a very nice $20 dinner for two. The wine we drank with it was more than twice that. Eek! And if that list doesn't show off a whore-like attitude towards television, I don't know what will. In any case, I usually cook with the more trashy shows in the background, and sit down to watch the better fare while eating. Tonight I'm going to make an Onion Tart with some leftovers from the party, and a "weed salad" with some greens I've got hanging about. I'll probably whip up a lemon dressing for the salad, as I have a pile of leftover lemons that will go to waste unless I start using them soon. The Onion Tart is a nice quick recipe that also looks/tastes great. It's basically one that Michel Richard (he of the late "Bistro M" in San Francisco and "Citrus" in Los Angeles. Both of which I've eaten at. Both of which are closed. Sob. If you are around Washington DC, check out his "Citronelle".) showed off in a "Cooking with Julia" show. A round of puff pastry is rolled out, and then heavily docked in the middle. Onions are diced, then sweated slowly to cook through (15-20 minutes). After cooling a bit, sour cream or creme fraiche is mixed in. Salt, pepper, thyme are the seasonings. 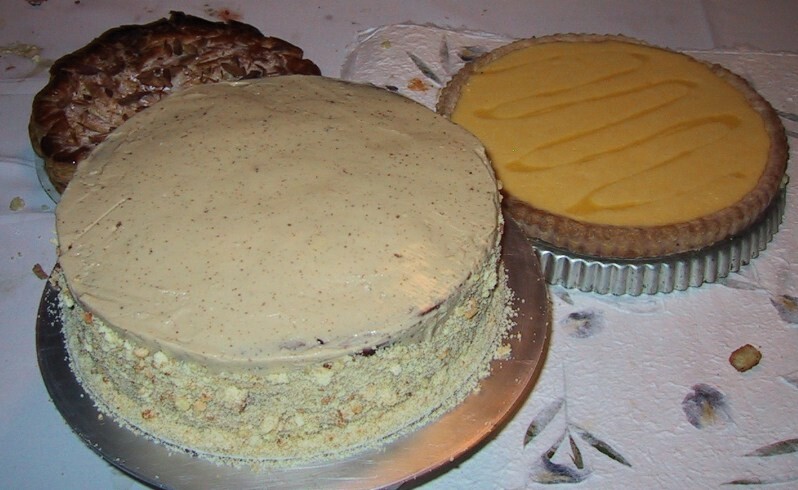 The resulting mixture is spread on top of the tart. Blanched bacon lardons are scattered on top. Baked at 375 for about 45 minutes. It's simple, but impressive looking. The taste is a great blend of sweet, smokey, salty, and sour. The texture has the crunch of the puff pastry and the heavy custard-like thickness of the filling. If you've got the puff pasty on hand (I do, as I made it for the party, using two pounds of Plugra butter in the process) its delightfully fast and easy to put together. I make a vegetarian version of this using one of my neatest "food hacks". Rather than bacon, I use cold smoked red bell peppers which I then slice into thin matchsticks. They sort of channel bacon in color and flavor, without being meat. With additional leftover chicken thighs, what better to do than fried chicken. Actually, I enjoy a whole chicken fried better. My personal two favorite parts are the top half of the breast with the wing drummette still attached, and the thigh. With just all thighs, I would have done BBQ or some sort of grilled treatment, but the weather here is still too windy and rainy to deal with that. No buttermilk in the house, so a combination of regular milk and Tabasco, along with sage and salt to form a brine. 45 minutes in the brine, and then drained. Dredged in flour, seasoned with some of my standard BBQ rub. Held on a rack for 5 minutes, dredged again, and then fried about 12 minutes per side. With the scrappings from the pan and some of the extra flour I made a milk gravy. But, since I've still got lots of cream, I used cream instead of milk. Guess that would be cream gravy then. Mashed potatoes, and we're good to go! Carol and I went over today to help out with my friend (and sous chef) John's baby shower. We've been having storms and wind here all weekend, so they had lost power the day before. John was therefore a bit behind in his prep -- he had trouble finding stores that were even open. We got there about two hours before the shower, and he had just finished the shopping and was starting to get organized. Time for power cooking! Lots of chopping, putting things together, random prep. It was tons of fun -- it's very different when I'm not the one in charge. I can just look for things to do and try to get them done. We made an onion tart, lamb and dill meatballs with a sour cream dipping sauce, latkes with smoked salmon, a sweet potato soup, humus, and a cheese tray (very nicely arranged, I might add). Finished with half an hour left over. Wa-hoo! The food turned out very nicely, and it certainly looked great. Peter Gabriel concert that night. What an incredible show he puts on. A complete nut. Joe Bob says check it out. Came home from a day of Christmas and Baby Shower shopping to find little in the fridge (still). Carol was coming over for a night of DVDs and wine, so I had to throw something together. Found some unused cherry tomatoes, leftover chopped tarragon, some dubious mushrooms, and some chicken thighs in the freezer. Hmmm. Did a long simmered tomato sauce, added some frozen homemade chicken stock, more herbs, some white wine and let it all cook down for three hours. Super-hot sautee of the chicken, then spooned the sauce around, into the oven for ten minutes. Hey! What's this! A bunch of real Parmigiano Reggiano! Onto the top, ten more minutes. Boil some rigatoni. Plate. Eat. Not too shabby. I'd like to call this entry "Weeknight" because I did it on a whim, but with a name like Blancquette de Veau I think it's just got to be French. Inspired by the Julie/Julia Project (see Links) I just had to cook something from Mastering the Art of French Cooking. That, along with the fact that I had a bunch of leftover stewing veal, eggs, a whole pile of Plugra butter, and more heavy cream than I know what to do with. And so it is that I'm drinking a Chardonnay, watching pointless bomb dropping on the Discovery: Wings channel, and waiting for veal stew to be tender. After that, it's a quick veloute sauce, and the final addition of eggs and cream to thicken it. Carol is missing this one, but it'll give me a chance to attempt to re-heat it for her. I'm curious if the sauce will curdle or not. I'm thinking that perhaps the starch in the sauce might allow it to work, much in the same way as pastry cream. It turned out great, and I served it over Cous Cous along with some parsley sliced into ribbons. I made the sauce with a good deal of lemon, but could still taste the veal. The stock as the veal was cooking came out crystal clear -- I used a two minute blanch that Julia recommends, and it worked a treat. My ex-roomate from the CIA just got a new five star review. Looks like he's doing awfully well now! If you're in Austin, be sure to check it out. One of the great things about cooking for friends once or twice a year is the fact that I'm helped by a great set of workers. Because it's not every day, they work hard, creatively, and for them it's a fun time. This is why I refer to them as my "Sous Chefs" rather than a bunch of line cooks. But the most amazing thing about cooking with a set of friends year after year is that we become something of a team. It lets me relax to know that I can trust them to handle anything if I'm not around or busy with something else. The recent phrase used has been "You got my back." One story from 2002 might explain something of what this is like. I was prepping some sauce for reduction -- basically just measuring out some things into a sauce pan. I'd added the stock and a few other things into the pan and was turning around to get the red wine. There was William with a bottle of red wine elevated in his hand. He knew what I needed. I hadn't even said "I'm going to make the sauce now." He just knew. Plating is another area where folks have become familiar with what I'm needing and wanting. I can tell any them what I'm looking for in general terms and they'll be able to handle it. I know that the platters will look great. Someone also commented on how well we work together in the kitchen. There are 4 or 5 of us in there at any one time, and the kitchen is fairly small. But the flurry of activity seems smooth and unhurried -- even in the heat of service. Because of all of the help -- and because the help is so reliable -- I can try things I'd never consider doing. As a result, the quality and scope of the dishes we do has become more complex over the years. I know I can push it and do more than I did at first. 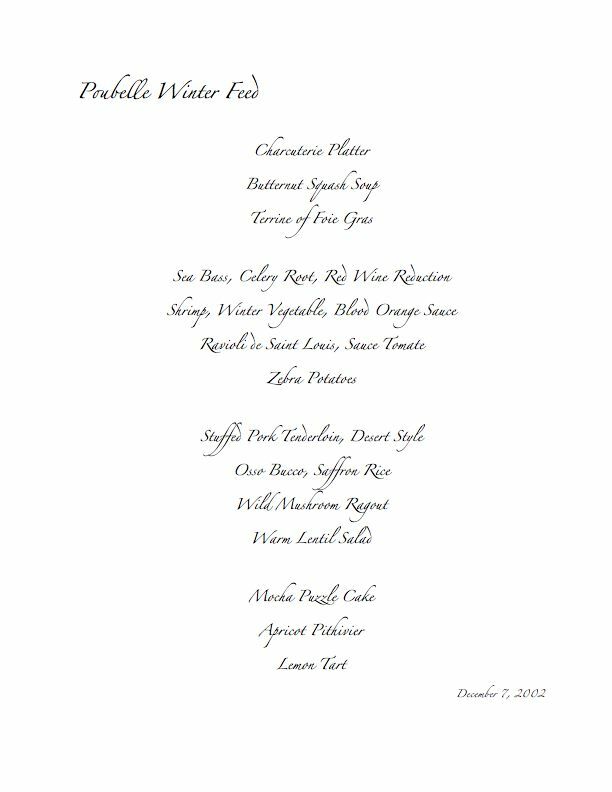 Here's the menu planning that went into the 2002 party. The links are to pictures of the dishes. We missed getting pictures of two of the dishes -- ah well. I like to have four "courses" in my meals. These are: appetizer/soup, fish course, main course, dessert. I try to have 3 or 4 dishes in each course. At least one of the appetizers is vegetarian. Half of the fish and main courses are as well. The desserts usually don't have meat in them either. I don't cook vegan, and I don't cook low-fat. My cooking style is fairly French and my bow to healthy eating is that not everything contains meat. It's my birthday, after all, so I don't really aim to make things that I won't enjoy. A charcuterie platter is a bunch of sausages and pate like items, served cold. 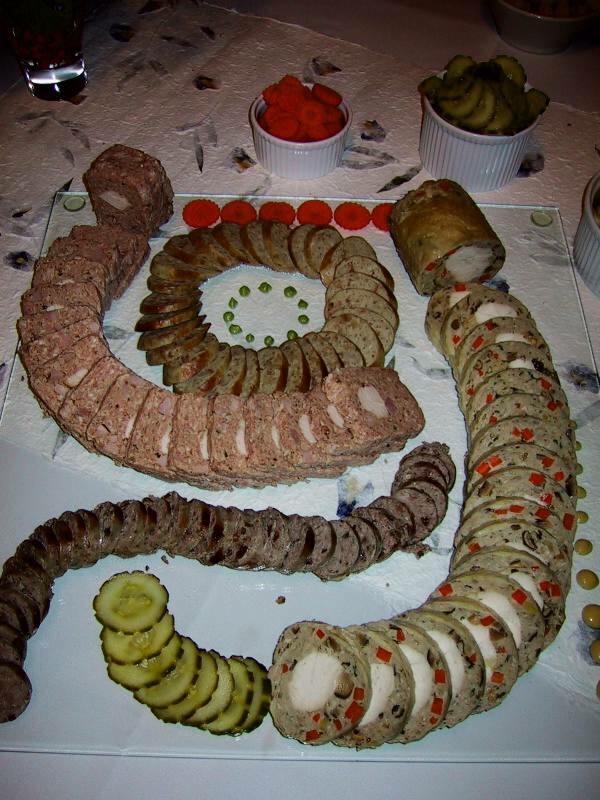 I wanted to do this because I hadn't made a pate in a few years, and I had some neat recipes for home make pickles. Also, most of this is make ahead. It does involve some elaborate plating, but that goes fairly quickly. I usually have a soup, and this year kept it vegetarian because of all of the other meat being served. Again, this is mostly make ahead, with re-heating and adding of the cream being a last minute step. I love Foie Gras, so I make this every year. 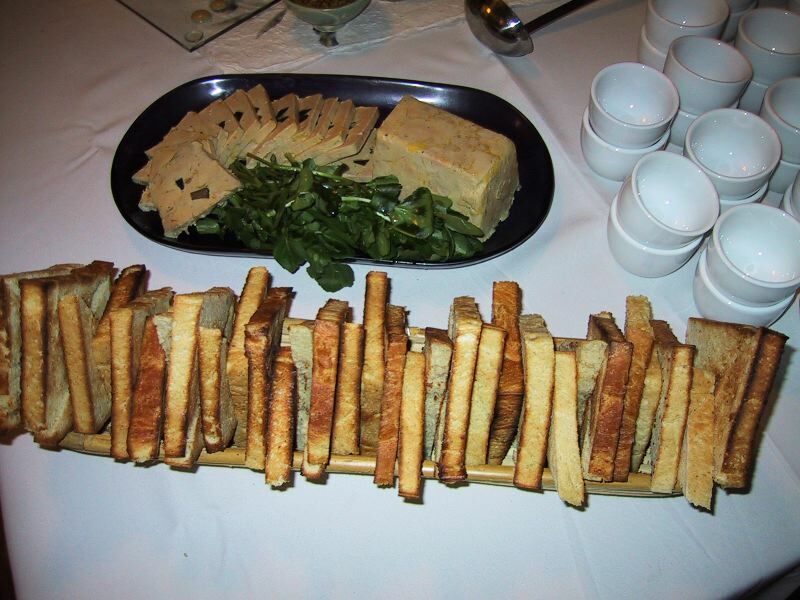 The foie is made a week in advance, and the pain de mie that it is served with the day before -- toasted the day of the party. I wanted a "thick tasting" fish dish here. Sea Bass can really stand up to meat-y flavors, so it was a good choice. This is also an easy dish to prepare. 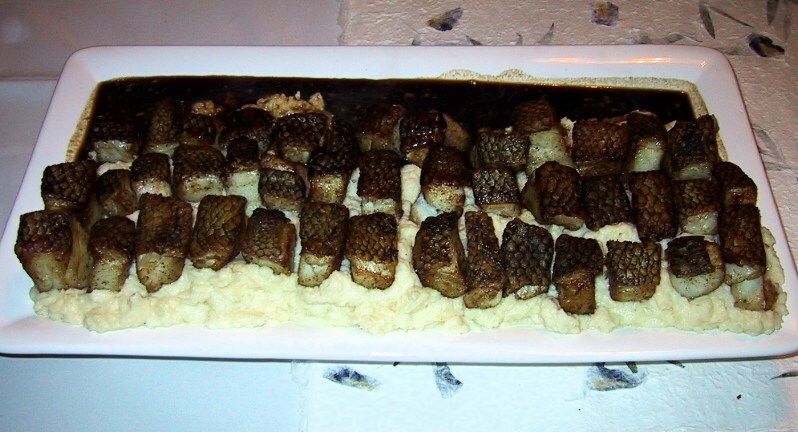 The fish is a quick saute in butter, the celery root is boiled with some potatoes and mashed to form the base, and a red wine and oxtail reduction stock poured around the result. A Charlie Trotter recipe. 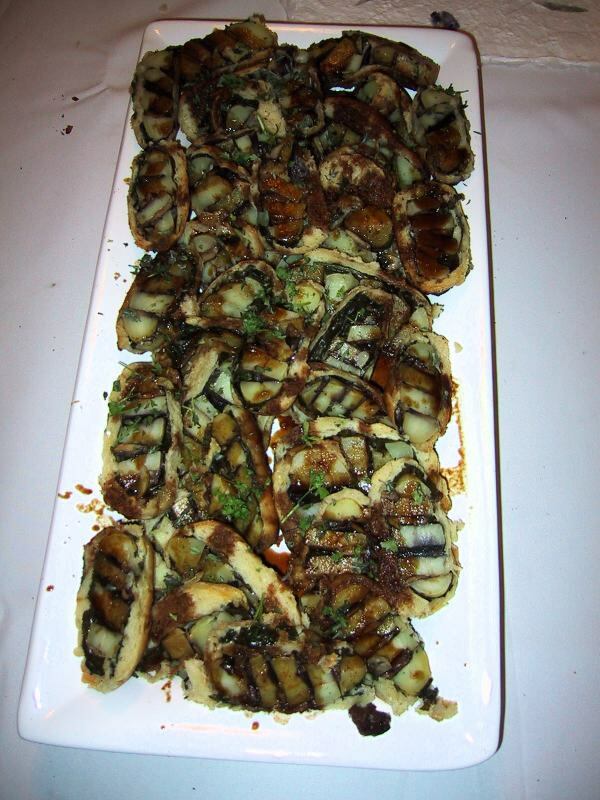 Small potatoes are boiled, slice, reassembled with mushroom slices between them, buttered with a flavored butter, wrapped in spinach leaves, re-wrapped in brioche dough, and finally baked for service. Sliced perpendicular to the original direction, the "zebra" stripes reveal themselves. A red wine and dark mushroom sauce completes this dish. Of course, this is all very labor intensive. This is where several hands make the work go quickly. But, it's mostly all done well in advance. With all of the heavy sauces, I knew I wanted a lighter dish as well. The base of vegetables was julienne of mixed bell peppers, fennel, and red onion. 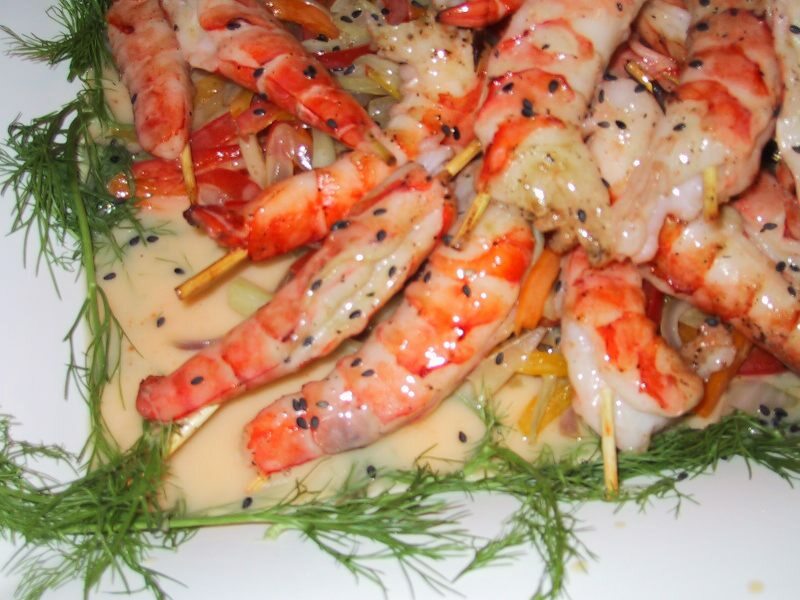 This was sauteed quickly, and the shrimp were broiled for 1 and a half minutes on skewers. The sauce was a blood orange beurre blanc, made ahead of time and kept hot in a thermos. A drizzle of the sauce and a sprinkling of black sesame seeds completed the dish. My parents now live in Saint Louis, and this is a traditional starter course there -- Deep Fried Ravioli. I made them ahead of time, breaded and froze them. The tomato sauce was a chunky homemade marinara, and the ravioli was topped with curls of parmasagn and basil. In spite of being deep fried, this is actually a nice bright dish to go with the others. Osso Bucco is braised in the oven, covered in a large hotel pan. It stays hot for a very long time once done, so it can rest outside of the oven, still covered. The Rissoto requires 20 minutes on the stove, so it a bit of work during service. 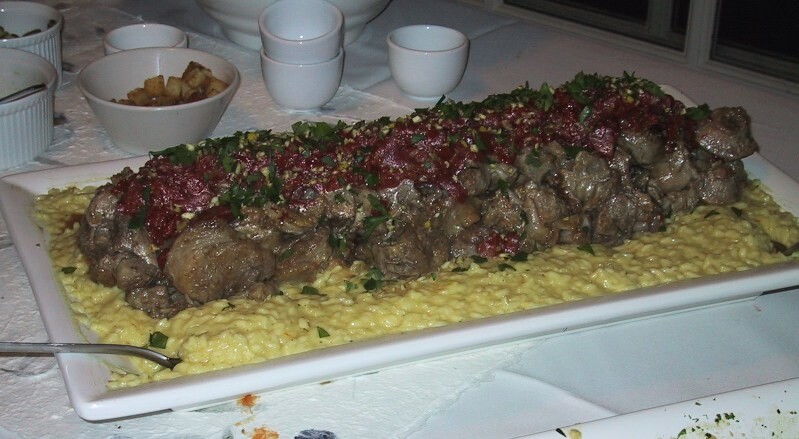 Plating is rissoto around the edge, with the osso bucco in the middle. William made the ragout the night before, so all that was needed was a re-heat. Buttered toasts with herbs, and roasted garlic custards to go under the ragout were done ahead of time. There was plenty of heat from the ragout itself to re-warm the custards. Guided by mid-eastern cooking styles, the stuffing was of diced red bell peppers, onions, mushrooms, and some hot sausage. The outside was rubbed in a spicy, salty, cinnamon rub. All of the prep was done ahead of time, and cooking consisted of 5 minutes of browning on top of the stove and 15 minutes in a 375 degree oven. 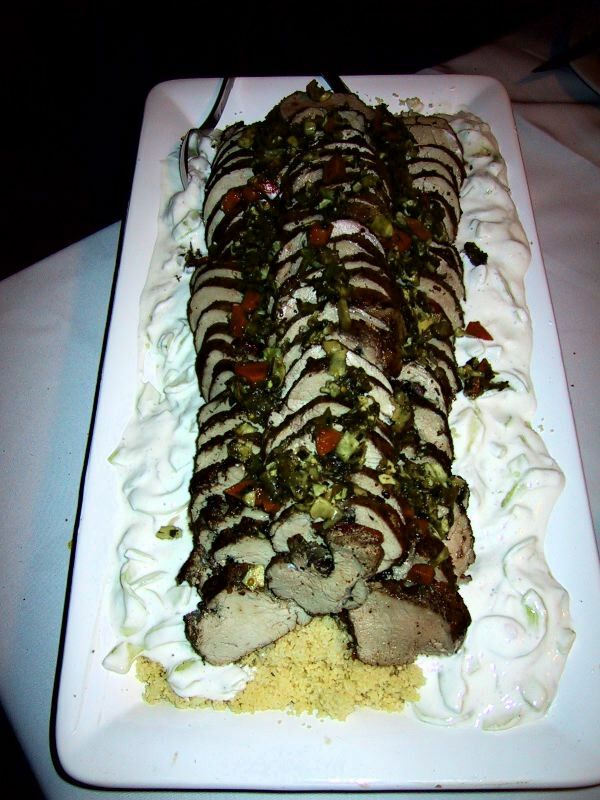 The pork was sliced and plated on top of cous cous (prepared in a rice steamer to free up a burner on the stove), and surrounded with a yogurt cilantro cucumber sauce. Very small diced carrots, parsnips, and rutabega was sauteed quickly. 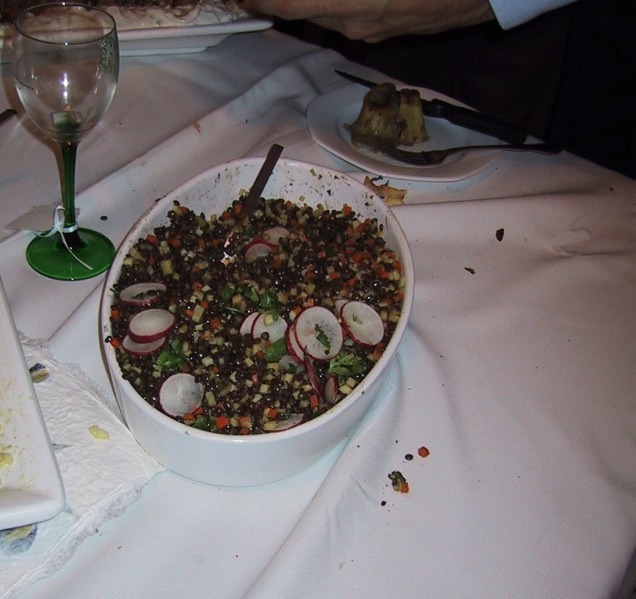 Tossed with boiled French lentils, and a mustard vinegarette. This is a classic Bo Frieburg cake that consists of alternating layers of chocolate and plain cake with buttercream frosting. Halfway through the assembly, a cone is cut from the center and the cake inverted. 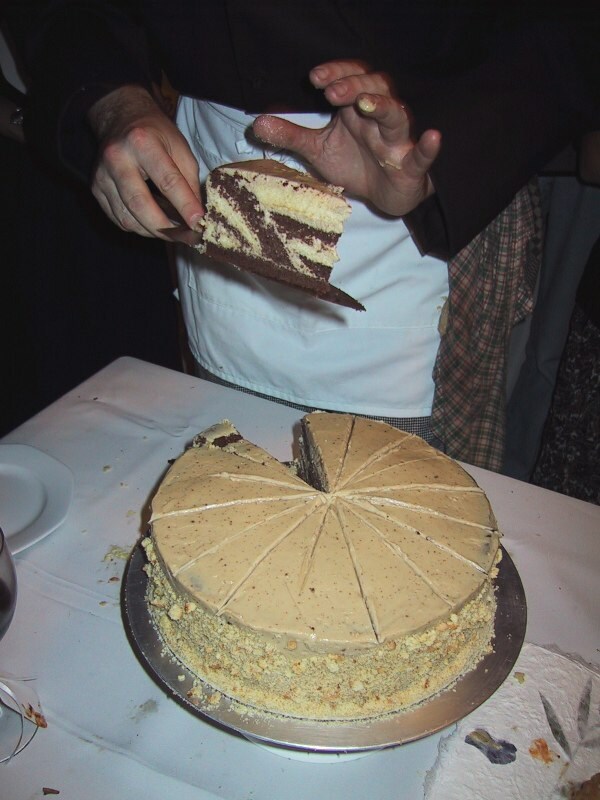 The final result is a cake with both diagonal and horizontal layers. Thus, the puzzle. Carol asked for a coffee and chocolate dessert, thus the Mocha in the buttercream. Also, one of my friends who came to the party is a puzzle maker, so I thought this was a fun idea. A pastry of almond cream and apricots surrounded by puff pastry. Very impressive looking, but easy to make ahead of time. The lemon curd makes this a simple dessert, but did not set up enough to my liking. I combined it with pastry cream to stiffen, and froze the resulting tart. The end result was maybe better than my original concept as a result. Every year I have a large party on or around my birthday. I invite friends over who I think will enjoy having the food that I cook. It's always a great time, and I can't imagine any other way to spend this day of the year. But lots of people can't imagine how it is possible to cook more than a dozen dishes on a four burner stove. Here's some things I've learned over the years. You can't pull off this much work without at least one person helping. I have a team of four very talented amateur cooks who help me. This includes prep work, setting up the ingredients, cooking, plating, and even cleaning. I've cooked with as few as one helper and as many as four. Depending upon how much help I have, I adjust the complexity of the dishes. I also plan more dishes that are "make ahead" when I have less help. Complex dishes that you haven't made before need a trial run. Weeks or months before, I'll make the dish. I'm testing a few things -- does the taste match up with what I want, does the assembly work, are the temperatures and times accurate? You have to do things ahead of time. During service, there should be no cutting of vegetables and other tasks that can be done ahead of time. All of the ingredients for a dish need to be measured out before hand. I use disposable containers such as drink cups or paper bowels. I place the ingredients into disposable aluminum sheet pans and cover with plastic wrap -- writing the dish name on top. For cooking, the entire pan can be brought to the stove, unwrapped, and is ready to go. I cannot live without lists. Typical prep sheets run 3 to 4 pages. I write down the steps to each recipe or dish. Each step also has a number of the dish it goes with, so that people can tell what they are slicing carrots for. I then place next to each one a time when I think that step should be started. I then re-order the list sorted by time. If I see too much stuff at a given time (such as around 2 o'clock) I see if I can shift some of the tasks around to eliminate the bottleneck. During the day, items are crossed off the list as they are completed. During service, likewise, steps are crossed off to keep track of what needs to be happening. Any of my helpers can also see what's next and what needs to be done. I typically shoot for all prep work to be done by four in the afternoon for a six o'clock start time. We usually hit this or slightly early. This leaves time for final checks and run-throughs before we start. Anything that gets missed will likewise have time to be corrected. You can't cook 16 dishes if every one requires 4 burners plus the oven. You need to have dishes that require no cooking, or just reheating. Some dishes that use the oven, others that use the top of the stove. If the oven is at 450 degrees, you can't also have a dish that needs 325. A good mix of cold, warm, last minute cooked items, and those done in the oven lets you produce combinations of dishes that go out together. 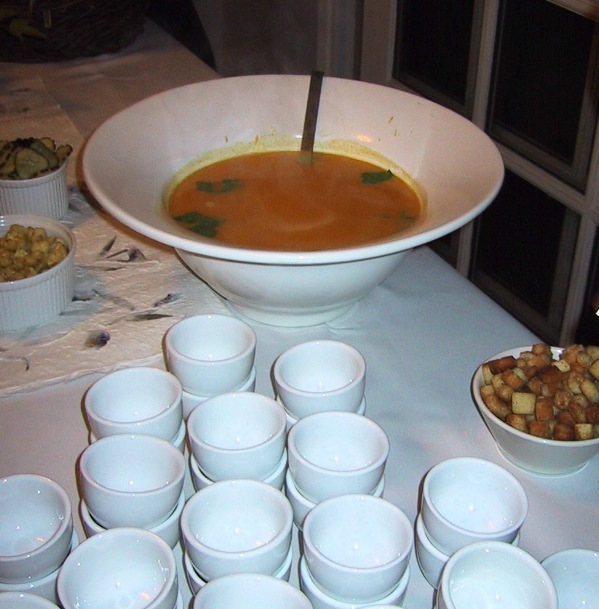 That having been said, it is difficult to get out more than two of these dishes at once time, so a typical course (which will have four dishes) is usually served two and two, with a small delay between them. Here's the prep list for the 2002 party. Some people have wondered about the planning that goes into these things, now here's your chance. The numbers match up with the master menu list numbers from the Menu Planning Entry. The 2002 Birthday party menu. Take a look. Cooking-wise, this was probably the best job that me and my 4 man crew have done so far. The food turned out well, and the work went smoother than ever before. More pictures are here.